How to create a subscription? You can create a new subscription from the Subscriptions section of the Inventory activity. Click on Inventory > Subscriptions. Click on Create in the action bar or directly in the Actions column. A Create Subscription window opens. Enter an Identifier (ICCID or ESN), Network identifier (IMSI) and/or Mobile Number depending on operator requirements. 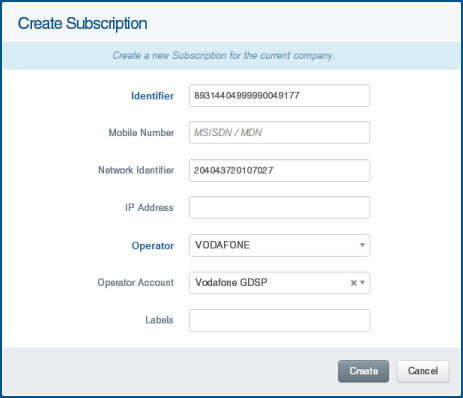 Select an Operator and Operator Account (see How to create an operator or SMS account? for more information). Once the subscription is created and associated with a system, you can choose to display the phone number (Mobile Number parameter here) in the Systems section, by adding a Phone Number column in the systems table (for more information on how to add columns, see The section Resizable, Collapsible and Sortable Table Columns in How to use AirVantage ).